When the days are shorter and the mornings are colder, the last thing you want to do is get out of bed early to shovel snow from your driveway. With WarmlyYours heated driveway system, endless shoveling is a thing of the past, even in the harshest of climates. Our driveway heating solutions are available as either snow melting mats or cables, which are embedded directly in concrete, asphalt, or in mortar under pavers. They're ideal for both residential use and commercial applications, and for any size or shape of driveway. 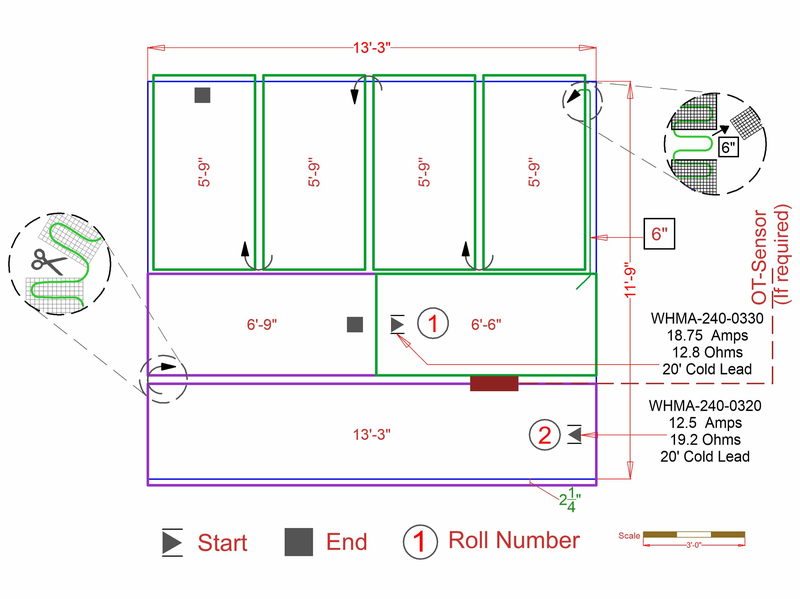 A complete snow melting system will typically include at least the heating elements (snow melting mats or cables) and a control (like the Advanced or Premium snow melting controls), but may also require additional components like a relay panel or an identification plaque. 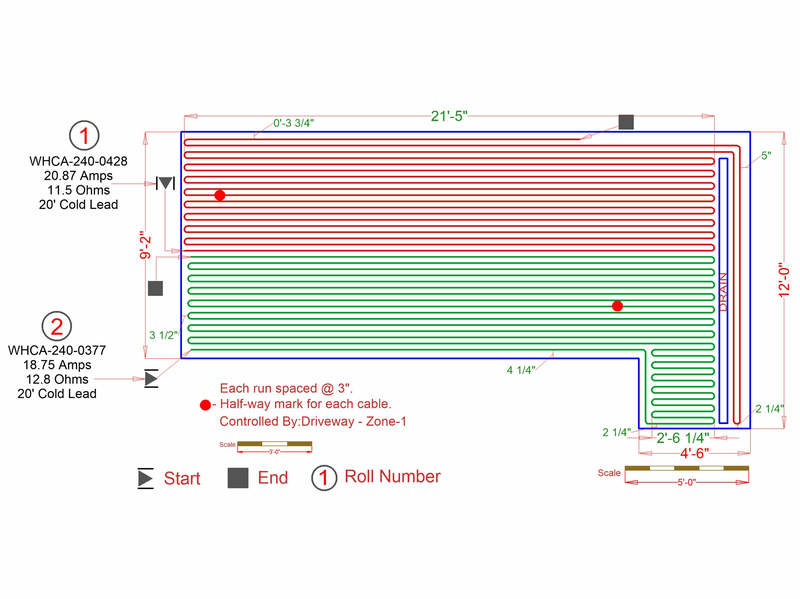 Take a look at our comprehensive Heated Driveway Design Guide or if you have any questions about what you might need for your project, make sure to contact our 24/7 Technical Support team via phone, chat, or email. Available in 2' and 3' widths and a variety of lengths, the driveway heating mats install easily and provide even spacing to ensure optimal performance. Available in a wide range of voltages including 120 and 240 for most residential applications as well as 208 and 277 for commercial projects. Why Install Driveway Snow Melting? Finally put away the rock-salt and shovels and start enjoying winter again. Do away with chemical melting agents, which will be easier on your pets and your vehicles. Melts the ice and snow, providing a safe passageway for you and your family, as well as guests to your home. Optional sensors/settings can detect when snow is falling and automatically switch on the snow melting system. No more expensive snow plowing services that can potentially damage your driveway. CSA certified for outdoor use in the US and Canada. Full coverage is certainly a functional and attractive option, as it means your entire driveway will cleared of snow and ice. If you’re concerned about the operating cost or the energy demand for full coverage, make sure to consider zoned heating. By using our Power Modulator controls for your snow melting system, you break your project into "zones" which are heated one at a time. The entire surface will still be cleared but you'll cut down significantly on per hour energy use & operating cost. One popular alternative to full coverage is to simply heat tire tracks. This economical option helps users cut down on both installation and operating costs, while still providing great functionality. Most WarmlyYours snow melting systems will continue to run past when the snow stops falling. This will typically evaporate the water left behind, and in its place, you'll find clean, dry asphalt. The controls range from simple manual devices to more sophisticated sensors that can automatically detect when snow is falling. The sensors can be positioned in the air or embedded in the ground for an automated service. Imagine relaxing by the fireplace in the comfort of your home on a snowy winter day, while your heated driveway does the work for you. Aside from the convenience they provide, heated driveways can also be a smart investment in your home. Take a look at our blog post to learn more about the cost of a heated driveway. Provide WarmlyYours with a sketch of the driveway that includes dimensions and other relevant information, you’ll receive a free SmartPlan within one business day that includes an installation plan, an electrical plan, and an itemized quote.